For additional Information concerning Skil (By BOSCH) Orbital Sander - 7335 : Click Here! 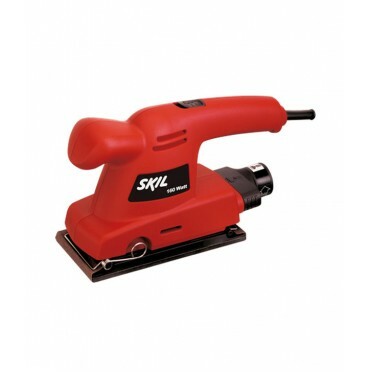 Whether you are a professional or you need a sander for your personal projects, or for any repair and maintenance work, you must check out the sander from Skil, available at Autocon. It weighs a mere 1.3 kilograms and can be the perfect tool for smoothening flat, wooden surfaces. It has a power rating of 160 Watts and a sanding surface of 92x185 mm. The Regular sanding sheet size is 93x230 mm. The sander has sanding movements of 24000 p.m. and a sanding orbit of 2 mm. When it comes to noise and vibrations levels, the sander has a sound pressure level of 77 dB, and a sound power level of 88 dB. It has a standard deviation of 3 dB. The uncertainty factor is 1.5 m/s. The tool is also equipped with an easy paper clamping system and dust suction for cleaner working environment. The on and off switch placed at the top of the machine allows easy access. Skil Power Tools is a popular brand and is an owned subsidiary of the Robert Bosch GmbH.